Take a visit to Osaka Aquarium Kaiyukan, named the best aquarium in Asia by TripAdvisor, as you explore its diverse collection of wildlife, before enjoying a scenic cruise on Osaka Bay aboard a historic ship. This combination aquarium visit and cruise offers a great family-friendly chance to introduce yourself to one of Osaka’s top attractions and some its best views from out on the water. 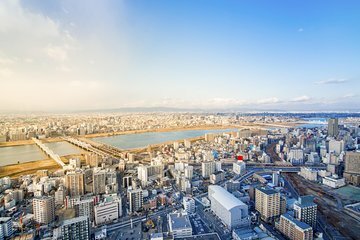 Start your trip in the afternoon at the Hotel Granvia Osaka, where you’ll meet your guide and then travel on foot to nearby Nishi-Umeda station. Board a local train to Osaka station, where you’ll arrive at the Aquarium. This fascinating aquatic attraction, located at Tempozan Harbor Village faithfully recreates the living environments of the creatures living in the “Pan Pacific Life Zone,” encompassing the various coastal environments that surround the Pacific Ocean. Begin your visit at the Aqua Gate, a 36-foot (11-meter) long tunnel-shaped walkway that gives the feeling of walking beneath the ocean surrounded by schools of colorful fish. Then spend the next 2 hours investigating the Aquarium’s more than a dozen exhibits. Stop by the interactive kids’ sections featuring touch pools where children can experience the unique skin of living sharks and rays, or explore the habitats of the huge range of plants and animals that live at center, spanning regions from Antarctica to the Tasman Sea. Leave the Aquarium and then continue your experience aboard the Santa Maria, a recreation of the famous flagship of explorer Christopher Columbus that is around double the original size. Relax for a 50-minute ride out on Osaka Bay, admiring sights like the Tempozan Ferris Wheel and Akashi Kaikyo Bridge from the water. Finish your trip by disembarking at the West Wharf, where you’ll return by food to Osaka station with your guide to end your visit. Nice exhibits on display. Main attraction to me were the dolphins. It was easy to go to Kaiyukan and may even have this tour on your own. My daughter enjoyed the trip to the Aquarium. You are allowed to touch the manatary/fish in a certain area after the aquarium tour. Unfortunately, I was not feeling well and we were not able to join the Osaka Bay Cruise. I stayed in the aquarium's clinic area. The staff were very helpful to attend to my needs. They strictly check if I had any allergies or fever before giving me the medicine. After the tour, our guide was kind enough to direct us where we can eat. This is a very good tour/area to go to for toddlers/kids, they will surely enjoy it, especially if they like animals.